St Stephen's Catholic College, Mareeba > Latest News > Heroes from St Stephen’s! 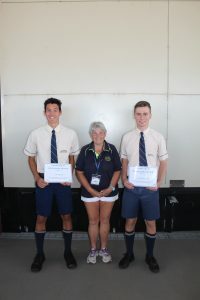 Mrs June Cotter from Cotter’s Aquatics Swim and Fitness attended Assembly last week and thanked year ten students, Jake Priestly and Alexander Fogale, for assistance rendered at an incident that occurred at the Mareeba Swimming Pool. Jake and Alexander were instrumental in ensuring that the appropriate authorities were called and ensuring the safety of Mrs Cotter and others at the pool.